The Great British Baking Show Is Back — But Is It Still Good? This post originally ran in August 2017. We are reposting it today in conjunction with the show’s debut on Netflix. We probably expect too much from our food shows. It’s not sufficient for a host to mug his way through the pancake palaces and greasy spoons of America — that person must be Guy Fieri, who represents the sentient id of a deep-fat fryer. A host can no longer teach viewers the perfect way to roast a chicken, they must do so while also soothing our various postmillennial neuroses. We aren’t satisfied watching the country’s best young chefs cook incredibly intricate restaurant dishes unless they do it with artificial time constraints against at least a dozen other young chefs. That quote is from Nadiya Hussain, who in addition to being a fantastic cook and the victor of the show’s sixth series — season three, Stateside — is a Muslim woman who sports fashionable hijabs and has become a star in her own right. 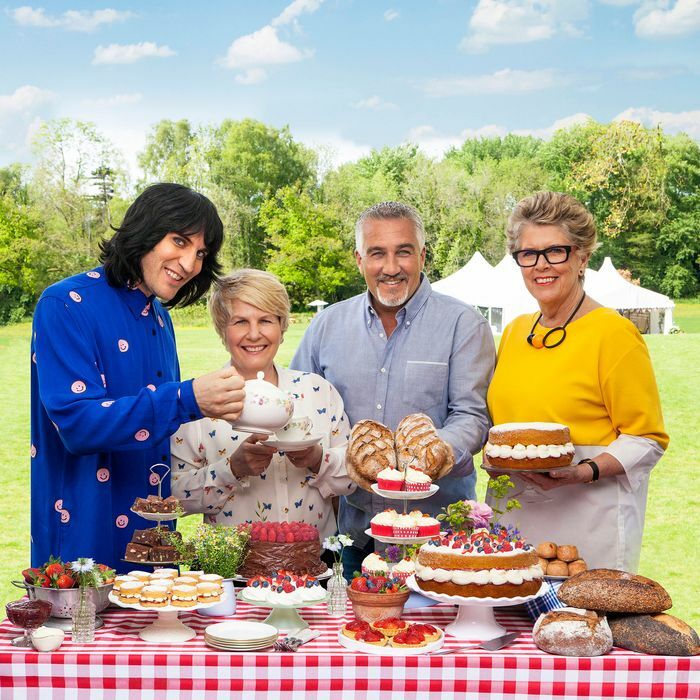 The marrow of most GBBO assessments is that the show’s light drama functions as a sort of spiritual balm that transcends borders, most notably seen in its sensible approach to issues of diversity and representation. It is also exceedingly popular: During the show’s previous season, which aired on BBC One, episodes garnered an average of 13.6 million viewers, and more than half the TV-viewing public throughout Britain watched its final episode live. Episodes can cause sheet-pan sales to spike by 800 percent, and one writer took an NSA-level look at social-media accounts to try to determine who would be a finalist before the most recent season began airing. The Great British Bake Off, in other words, is required viewing. So you probably heard, many times, that the show has been ruined by creator Love Productions’ cash-grab-motivated migration from (the relatively staid) BBC One to (the flashier) Channel 4. Only Paul Hollywood, one-fourth of the show’s original hosting team, made the jump to the new show. Beloved hosts Sue Perkins and Mel Giedroyc are headed into game-show territory, and the even-more-beloved Mary Berry diplomatically stayed behind at BBC to tour “stately” homes and help locate Britain’s Best Cook. I am an on-the-record Baking Show/Bake Off superfan, and I didn’t know what to expect when I fired up a screener of the new season’s first episode. It was difficult to believe Hollywood when he proclaimed the retooled show is “10 times better” than the original, because that is so obviously impossible. The rumored changes seem far too drastic, and likely to undermine the show’s inherent charm. Let’s start with the hosts. In Berry’s place is Prue Leith, a South African author who has sold a gazillion cookbooks. Also joining are comedians Sandi Toksvig and Noel Fielding, who is probably best known to fans of extreme British weirdos like Old Gregg, a Day-Glo-fabulous merman from The Mighty Boosh. If you don’t follow such things, it’s probably sufficient to say that he looks like the benevolent, steampunk version of Russell Brand. British tabloids had a field day with Fielding in particular, reporting that he will be “AVOIDING” sugar and cakes on set, before following up with an “exclusive” photo of Fielding toting a pack of McVitie’s biscuits. It got to the point where the comedian was forced to “clarify” his comments, as if he was in damage-control mode after a major PR crisis. That’s not to say there aren’t also some mildly troubling signs. The jaunty, pizzicato soundtrack is back, but where the background music once functioned as sonic Klonopin, it now sounds louder and more constant. 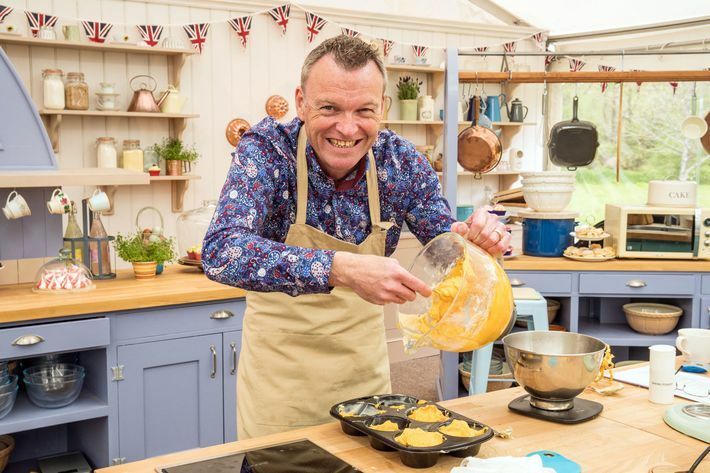 If the tent itself also seems less pastel and maybe even a little daunting (“I don’t think anyone has any idea quite what the tent does to you in there,” one baker remarks), it can definitely be chalked up to the show’s new, complete lack of Mary Berry’s soothing vibes. Aside from a silly cold open in the premiere that involves a fake hot-air balloon, Paul Hollywood is stoic as ever, but with higher-quality, less shellaclike hair product, and it’s exactly two seconds into the episode before it’s readily apparent that Mary Berry’s gentle, posh compassion has given way to Prue Leith’s more stentorian tone, which is amplified by a stylish, red, tuniclike jacket that bears faint traces of Hunger Games antagonism. Like the music, it all seems a little too carefully produced. The Great British Baking Show Is Back — Is It Still Good?